I’ll admit right now that I’m not as big of an Arsis fan as, well, a “True” Arsis fan. I personally believe there isn’t anything really original about their music, I think that they are FAR from qualifying as one of the best bands of the decade, and I don’t share many of our forum’s Arsis-ites’ belief that A Celebration of Guilt was the best thing to happen to technical death metal in the 21st century (Though I must say, it is one helluva album). 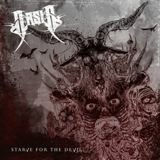 Nevertheless, I still jumped on reviewing duties when I heard about the coming of their fourth full-length, Starve for the Devil; partly because none of the other reviewers seemed too particularly excited about it, but mostly because Arsis is simply a ridiculously fun band to listen to – if I’m in the right mood, that is. I’d like to apologize to our regular readers / Arsis fans that this review took so long to come about, but at long last I’m finally feeling up for some technical melodeath action and I’m pleased (and perhaps a bit relieved, on account of the fanboys) to say that Starve for the Devil is, indeed, a great album. With SFTD, Arsis has dropped much of the technical baggage that weighed down We are the Nightmare (a rather poor and soulless album, in my opinion) and has instead decided to focus more on the melodeath aspect of their sound this time around. There are still many complex flourishes present - sweeping licks and technical riffs punctuate the album in appropriate places – but this is a much simpler Arsis that’s (somewhat) more similar to a better written version of United in Regret than to Celebration or Nightmare. Hell, Starve sounds downright thrashy in spots; NWOBHM-inspired lead single Forced to Rock reminds me much of Bring Me the Night from Overkill’s latest, and the chunky riffs on Beyond Forlorn could teach many modern thrash bands a lesson or two. The album also opts for double-time drumming more than any other drumming style present, and probably utilizes it more than on any other Arsis album. There even seems to be some welcome experimentation afoot; I really, truly dig the pseudo-post-black approach of Closer to Cold, and the aforementioned Forced to Rock is really quite different from anything Arsis has ever done. The silly yet effective melodies of Sable Rising make that song another highlight on the album, and it closes out Starve in excellent fashion. As far as production goes, this is definitely the best on any Arsis album, and a thankful departure from the dryness of Nightmare’s sound. It’s crisp but not overpowering, just as it should be, and also how it should be on nearly every melodeath album in existence. The lyrics, however, seem a bit too childish considering the fact that, otherwise, this is one of Arsis’ most musically mature albums; songs titles like Half Past Corpse O’ Clock and lyrics such as ”In the name of Satan, we are forced to rock” are just plain silly. I can applaud the band on having fun writing the lyrics, but at the same time, it all feels a bit out of place. As far as consistency goes, SFTD remains solid throughout, though the first half of the album seems to be more entertaining; I tried starting the record once at track six and let it play from there to see if it suffered from “It gets old quickly” syndrome, but it turns out that the best material (with the exception of Closer to Cold and Sable Rising) has been placed first. In truth, I really can’t find much to criticize Starve for the Devil over; it’s an extremely solid album, and how good it is really only depends on how much you enjoy Arsis as a whole. Devoted fans can easily buy this album blindly, but those who are a bit skeptical will definitely want to give Starve a listen first before investing money in it. Though STFD isn’t Arsis’ best (though it’s probably second best, behind A Celebration of Guilt, which is still a pretty wide gap in my opinion), it’s definitely a solid album that has me somewhat eager to hear what they have to offer in the future.